Purified recombinant fragment of WNT5A expressed in E. Coli. 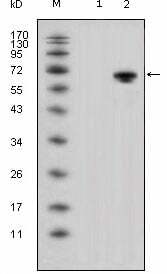 Small volumes of anti-WNT5A antibody vial(s) may occasionally become entrapped in the seal of the product vial during shipment and storage. If necessary, briefly centrifuge the vial on a tabletop centrifuge to dislodge any liquid in the container`s cap. Certain products may require to ship with dry ice and additional dry ice fee may apply. WNT5A: wingless-type MMTV integration site family, member 5A. Entrez Protein: NP_003383. The WNT gene family consists of structurally related genes which encode secreted signaling proteins. These proteins have been implicated in oncogenesis and in several developmental processes, including regulation of cell fate and patterning during embryogenesis. This gene is a member of the WNT gene family. It encodes a protein which shows 98%, 98% and 87% amino acid identity to the mouse, rat and the xenopus Wnt5A protein, respectively. The experiments performed in Xenopus laevis embryos identified that human frizzled-5 (hFz5) is the receptor for the Wnt5A ligand and the Wnt5A/hFz5 signaling mediates axis induction. 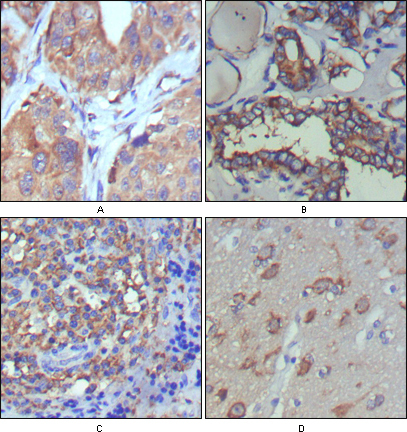 Figure 2: Immunohistochemical analysis of paraffin-embedded human lung cancer (A), thyroid cancer (B), lymph node (C) and brain (D) showing cytoplasmic and extracellular matrix localization using WNT5A mouse mAb with DAB staining. 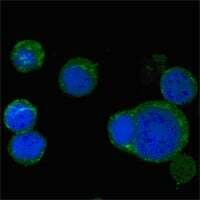 Figure 3: Confocal immunofluorescence analysis of PC-12 cells using WNT5A mouse mAb (green), showing cytoplasmic localization. Blue: DRAQ5 fluorescent DNA dye. NCBI/Uniprot data below describe general gene information for WNT5A. It may not necessarily be applicable to this product. Ligand for members of the frizzled family of seven transmembrane receptors. Can activate or inhibit canonical Wnt signaling, depending on receptor context. In the presence of FZD4, activates beta-catenin signaling. In the presence of ROR2, inhibits the canonical Wnt pathway by promoting beta-catenin degradation through a GSK3-independent pathway which involves down-regulation of beta-catenin-induced reporter gene expression (). Suppression of the canonical pathway allows chondrogenesis to occur and inhibits tumor formation. Stimulates cell migration. Decreases proliferation, migration, invasiveness and clonogenicity of carcinoma cells and may act as a tumor suppressor (PubMed:15735754). Mediates motility of melanoma cells (PubMed:17426020). Required during embryogenesis for extension of the primary anterior-posterior axis and for outgrowth of limbs and the genital tubercle. Inhibits type II collagen expression in chondrocytes (). 1. These findings suggest that WNT-5A modulates fundamental mechanisms that affect airway smooth muscle contraction and thus may be of relevance for airway hyperresponsiveness in asthma.